A2 Milk is a specially designed cows milk that comes from specially-selected British cows whose milk is naturally free from a protein called A1, a protein that can lead to digestive discomfort for many people when consumed. If you're lactose-intolerant, you still won't be able to drink it, but some people are diagnosed as lactose-intolerant when in fact it is just the A1 protein causing them problems. 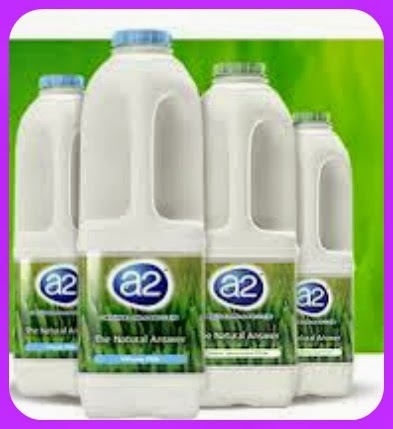 A2 was launched as a brand last year and had many fantastic reviews from people who were able to reintroduce milk back into there diet as a result of changing over to A2 milk. In our house none of us have an intolerance to milk or need to drink a specially designed milk however we were happy to try out the milk, as you can see from the bottles the milk doesn't look a lot different from other milk brands that are around on the shelves, we tried out the blue top milk - the whole milk as both the boys always still have milk at night and on there breakfasts, there was no complaint about the milk being any different to them. I also used the milk to make pancakes yesterday and honestly I couldn't taste any difference in the milk - which is great for those that are A1 intolerant, lets face it when you have milk you want it to taste like milk whether it has an ingredient missing or not. we were sent a voucher to purchase A2 milk for the purpose of this review all opinions expressed remain honest and my own.